In a shady cemetery plot at New Bethel Church, about seven miles southwest of Ray City, GA, lies the grave of the town’s first elected mayor, Dr. Charles X. Jones. 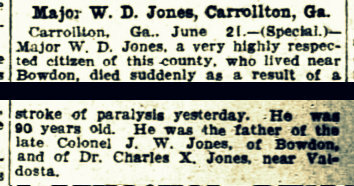 Charles X. Jones was born in Carroll County, GA on September 15, 1870 (or 1869 according to his death certificate). When Charles was born his father, Maj. William Dudley Jones, was 50 and his mother, Martha H. Word, was 45. His father was a farmer at Bowdon, GA and also served as county tax collector of Carroll County. His mother’s parents were John Bryson Word and Amelia Sparks. Charles X. Jones grew up on his father’s farm near Bowdon, GA in the 1111th district of Carroll County. Bowden was a progressive community and the site of Bowdon College, “Georgia’s fifth chartered institution of higher education and first coeducational institution. Bowdon was a frontier community of merchants and yeomen who nourished the growth of a school where earnest students of limited means bettered their lives and their communities…Graduates have carried the honor of the institution into our state and national capitals and throughout the world. From her halls have come educators, doctors, lawyers, journalists, judges, bankers, farmers, industrialists, governors, and senators.” Charles X. Jones was admitted to Bowden College where he completed the full program of study and graduated on July 1, 1891. 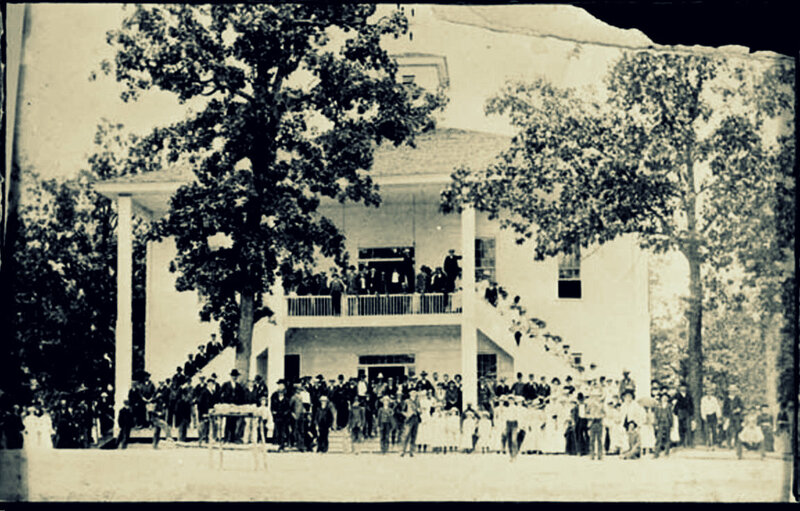 Bowdon College, GA, photographed circa 1899. Charles X. Jones graduated from Bowdon College in 1891. Jones later attended the medical school in Augusta, GA now known as Georgia Regents University, and received his medical degree in 1898. 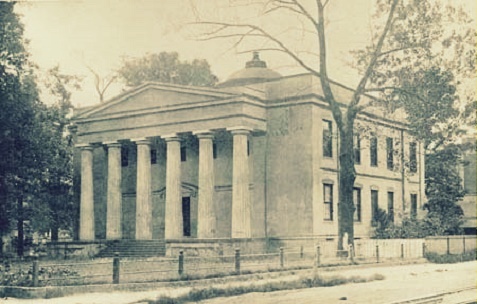 Old Medical College of Georgia, Augusta, GA. Charles X. Jones graduated with a medical degree in 1898. After medical school, young Dr. Jones came to Berrien County,GA to the Ray’s Mill Community. He boarded with James S. Swindle and Catherline “Candas” Swindle while establishing his practice. Census enumeration of Charles X. Jones, physician, in Rays Mill, Berrien County, Georgia, on June 13, 1900. 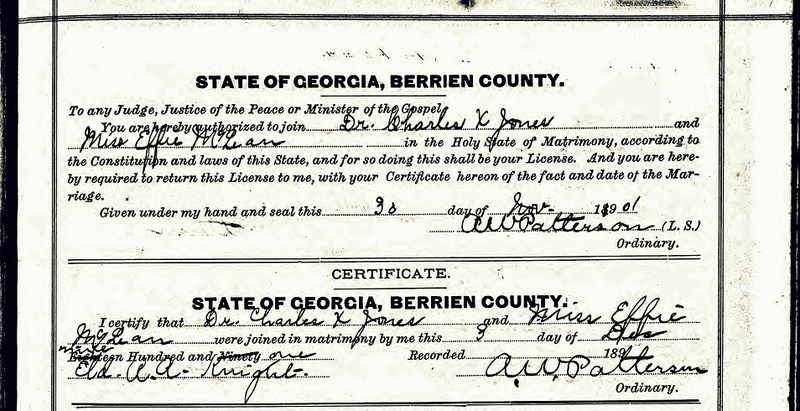 Dr. Charles X. Jones married Effie J. McLean on December 3, 1901 in Berrien County, GA. In 1903, Charles X. Jones purchased a 4 acre tract of land from James S. Swindle along Card Creek, the outflow of Ray’s Millpond now known as Beaverdam Creek. That same year Charles and Effie began their family with the birth of their first child, Sam Jones. In the summer of 1905, word came from Bowdon, GA that Dr. Jones’ father had died of a stroke. The obituary was published in the Atlanta Constitution and other state papers. Obituary of Major William Dudley Jones, died June 19, 1905. Atlanta Constitution, June 21, 1905. Major W.D. Jones, Carrollton, Ga.
Major W. D. Jones, a very highly respected citizen of this county, who lived near Bowdon, died suddenly as a result of a stroke of paralysis yesterday. He was 90 years old. He was the father of the late Colonel J. W. Jones, of Bowdon, and of Dr. Charles X. Jones, near Valdosta. In 1908, Charles X. Jones’ tract of land was platted into town lots in the newly incorporated town of Rays Mill, GA. Charles and Effie built the first house in the town and became its first residents. This house was located on the lot that surrounds the present Methodist Church. The street which ran past the Jones residence was named Jones Street in the doctor’s honor. Redding D. Swindle was appointed as the mayor until the first elections could be held, and Jones carried the election in the first casting of ballots for the government of the new town. Mary Etta Swindle, wife of R.D. Swindle won a contest to name the new town, proposing it be called Ray City, GA although the title of Rays Mill persisted for many years thereafter. The Jones residence was the very first household enumerated in Rays Mill, GA in the census of 1910. 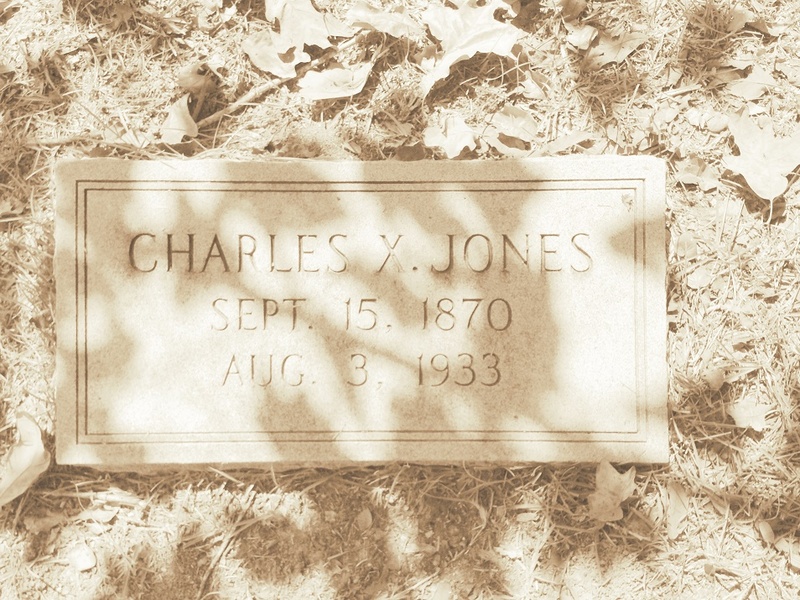 Dr. Charles X. Jones was enumerated with a reported age of 39, wife Effie J. Jones (26), and their children Sam Jones (7), Fred Jones (5), Trixie Jones (3), and Charles X. Jones, Jr (1). 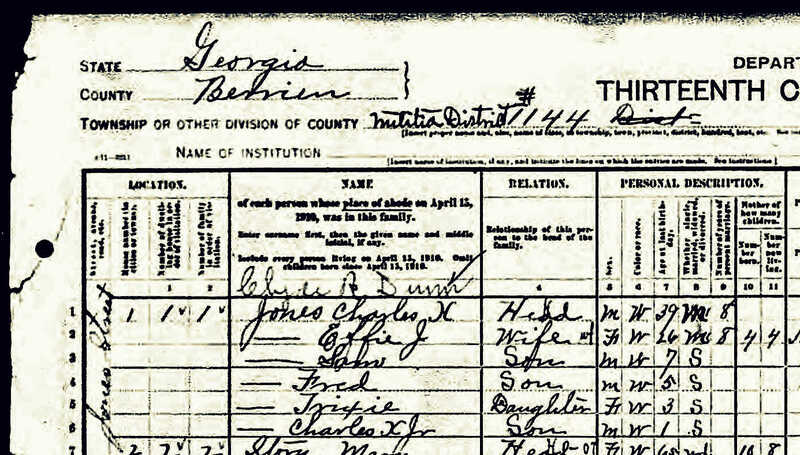 Census enumeration of Dr. Charles X. and family in Rays Mill, Berrien County, Georgia, April 15, 1910. Dr. Jones was also a banker. When the Bank of Rays Mill was formed in 1911, Dr. Jones was elected Vice President of the bank, and served on the Board of Directors along with B. P. Jones, J. S. Swindle, J. H. Swindle, W. H. E. Terry, L. J. Clements and bank president Clarence L. Smith. Later, Charles X. Jones and Clarence L. Smith served together on the board of directors of Southern Bank & Trust Co., formed 1913 in Valdosta, GA. The Southern Bank & Trust Company closed its doors in 1918. A legal notice in the January 6, 1912 edition of the Valdosta Times shows that Dr. Jones had acquired property at the community of Barretts, about five miles south of Ray City. The Dr.’s land apparently fronted on the public road then running from Ray City to Valdosta (now known as Barretts Road) and was bounded on the south by the property of T. J. Taylor. The 1920 census places Dr. Jones on his farm at Barretts, where he had relocated and continued his medical practice. This was in the 1307th Georgia Militia District, the Cat Creek District of Lowndes County, GA. In the census of 1920, Jones residence was enumerated by census taker Arthur Walton McDonald, brother of Lacy A. McDonald who was a mailman at Ray City. By the time of the 1930 census, Charles X. Jones was about 60 years old and retired from medical practice. His farm place near Barretts, valued at $5000, was owned free and clear of mortgage. Census record indicate Jones had become a merchant/operator of a dry goods store. Also in Dr. Jones household were his son, Charles X. Jones, Jr., daughter Trixie Jones Moore (widow of Carl L. Moore), and her children, Mattie Lou Moore and Helene Moore. Trixie Jones Moore, worked as a general merchandise clerk, while Charles X. Jones, Jr. helped with the farm work. 1930 census enumeration of Charles X. Jones, Lowndes County, GA. Now retired from medical practice, Jones operated a dry goods store and maintained his farm in the Barretts Community. On August 3, 1933 Charles X. Jones suffered an attack of “apoplexy” – a venerable word for a stroke, a cerebrovascular accident (CVA), often associated with loss of consciousness and paralysis of various parts of the body. Before the day was out he succumbed to death. Charles X. Jones was a civic minded citizen and an important figure in the incorporation of the town of Ray’s Mill (now Ray City), GA. He was said to be a leading spirit of the town.